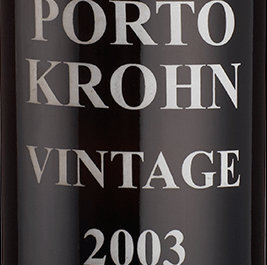 Krohn Vintage 2003 Port, retaining a deep and youthful colour, the nose has intense black fruit characters, with notes of sweet spices, liquorice and vanilla. Krohn Vintage 2003 Port, it is drinking well now, but still has many years ahead. Krohn Vintage 2003 Port, the vintage starts a wet weather in winter and spring of 2003 was followed by a very hot August. Grapes showed high concentration and sweetness but relatively low acidity. The result is this award-winning Port - rich, powerful and complex. Traditional grape varieties are sourced from the Quinta do Retiro Port estate and neighbouring growers in the Rio Torto Valley. Here old vines are planted in schistous soils. Fermentation is in open granite tanks called 'lagares', where the grapes are trodden by foot. Fermentation is interrupted by the addition of grape spirit to preserve a certain degree of natural sweetness. Aged for around 2 years in 547 litre oak barrels (the traditional 'pipe') and larger casks. Then bottled (unfiltered) and aged for several more years before release.